A hauntingly beautiful and meditative musical journey to Arcosanti featuring the magical sounds of the Soleri Bronze Bells accented by Bamboo bass flute, silver flute, hammered dulcimer, guitar, bamboo sax, didgeridoo and the unique ambient atmospherics of Arcosanti. Recorded in part at the legendary architectural and ecological habitat of Arcosanti, designed by visionary artist and architect, Palo Soleri. Featuring the magical overtones of the Soleri Bronze Bells. PURE MAGIC – From the first few moments, with the pure metallic tones of bells large and small, and earthy sounds of bamboo flute, you know you’re hearing something special. This recording was made within and around the ecological/architectural site of Arcosanti in the Arizona Desert, described by the producers as “Architecture that sings with spirit”. 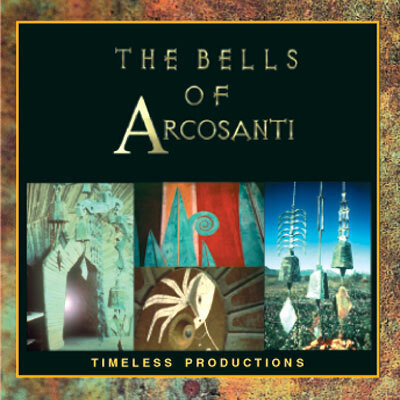 Within the vaulted domes and spacious curves of Arcosanti’s structures, the site itself became the recording studio for this collection of meditative compositions, capturing the magical harmonics and overtones of bronze bells that hang everywhere. While some ring ambiently others are played percussively, then blended with a variety of instruments: Japanese bass flute, bamboo saxophone, acoustic guitar, didjeridoo, silver flute, hammered dulcimer, and a special appearance by Celtic vocalist Kate Price. The rich harmonics of bronze bells evoke a natural relaxation response, and create and ideal ambience for meditation, massage, yoga, tai chi and journeying.